SINDHUPALCHOWK, Nov 24: It’s already afternoon on Wednesday. 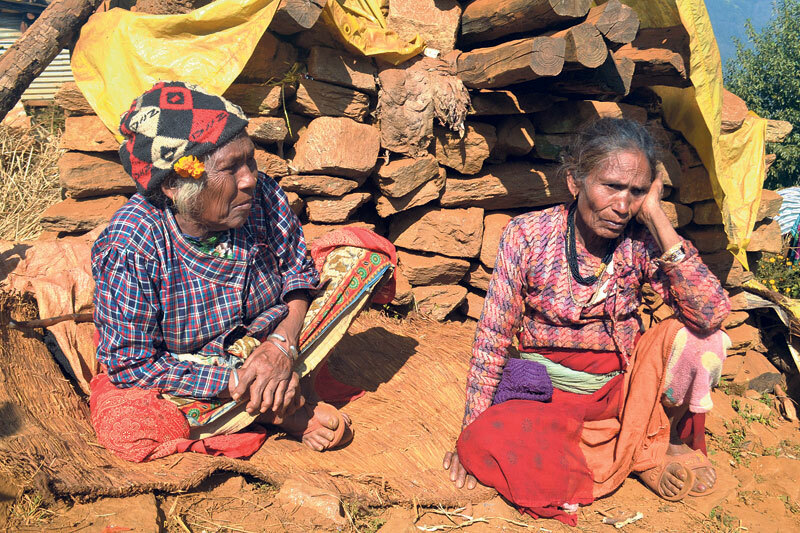 Ratna Kumari Nepali, 63, stepped out of her room and looked around for a sunny spot to sit. “I do not come out of the room unless the sun warms up. It’s too cold,” said Nepali. “But sometimes it does not remain here for long and sometimes it doesn’t even show up,” she lamented. A patient of asthma, Nepali is very anxious of her health this winter. Lack of a warm house to live in is her biggest worries these days. “After the earthquake destroyed our house, life has been miserable. I feel difficult to breath when the cold increases. Without a warm house and with this illness, I am not sure if I will survive this winter,” she said. A resident of Dhaukhani village, while she was sharing her concerns, she started having an asthma attack. She started to cough very hard and it felt as if she would vomit. Cold has just arrived. It is yet to grip the locals and shiver them. And Nepali is well aware of what awaits her in the days ahead. Recounting her ordeal last winter, she said she was bedridden for many days during the peak cold. And despite her daughter’s effort to keep the tent warm, cold had reigned in her tent and the dew had never allowed the clothes give her the warmth she needed. “I had fallen ill due to cold last year and had recovered only after receiving oil massage from my dauther . I had to go through the ordeal even though I was in much better health than this year. But I am much weaker this year and I am not sure if I will survive,” said Nepali, a mother of three sons and a daughter. Ramchandra Chauhan was spotted dismantling the hut his family had been living in since the earthquake destroyed their house. Even though the hut in Sangli Bhanjhyang sheltered his family for the last one and half year, he says that his family can’t bear the cold anymore. “We cannot live like homeless any more. I am dismantling it so that I can go back to my village,” he said. 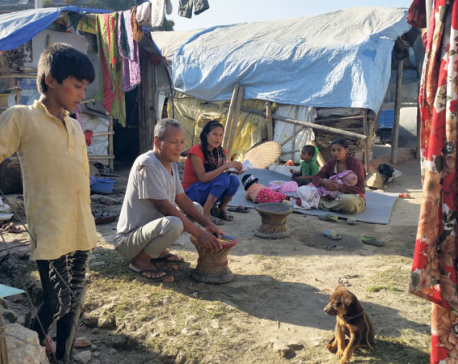 Nineteen families including Chauhan’s had been displaced from the village by the earthquakes in April last year. Along with him, other villagers in the settlement are shifting back to their village for the same reason. The dipping mercury has already started taking toll on health of Tatopani, Listi, Gunta, Baruwa, Golchhe, Gumba, Hagaam, Selang, Kiul and Fulpidanda residents, among other villages here. “This year, it seems winter has arrived quite early. Or it could be that we have got old and our feeble body is feeling so,” said Ram Kumar BK, 77. He said that children in his family have been coughing because of the cold. “We can’t afford making a new house. The grant that the government provided to us is finished while fulfilling my family’s need,” he said. BK’s seven-member family has been living in a makeshift shelter. As the reconstruction work has not taken much momentum, earthquake victims like the ones quoted here have no choice other than to continue facing the cold in huts, this winter also. Data of the District Administration Office says there are 79,000 earthquake grant beneficiaries. Among them, 74,000 have received the first grant installment. The rest of the victims are still waiting for their turn. 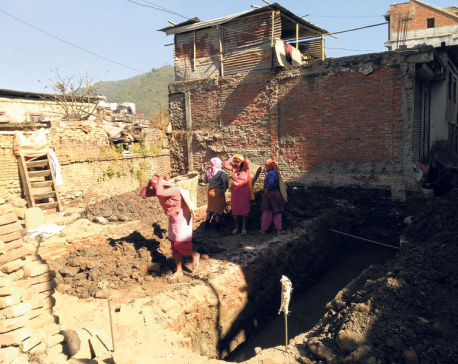 Tanka Gautam, acting chief of Division office of Department of Urban Development and Building construction, stated that as of Wednesday only 1623 quake victims have started constructing their house. 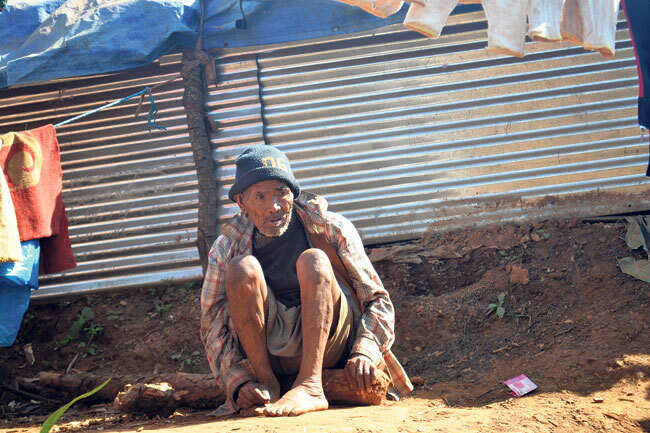 Ram Kumar BK, 77, sits in the warmth of the sun outside the hut which has been housing his 7-member family in Dhaukhani, Sindhupalchowk on Wednesday.